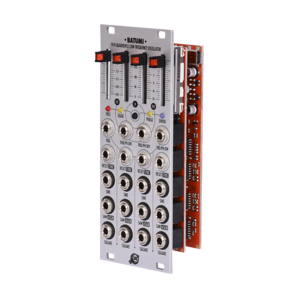 Voltage controlled, quadruple digital LFO module with a slew of interesting and user-customizable features. Each oscillator can be used independently or in one of 3 synchronized modes: quadrature, phase and divide. For each oscillator, there are sine, square and assignable (saw, ramp, triangle and trapezoid) waveform otputs available. Voltage control is possible for each oscillator’s frequency, reset, and external sync (“tap tempo”). The total frequency range spans from 28 hours in voltage controlled divide mode, up to 500 Hz. • An universal breakout module is planned to allow instant access to waveform selection jumpers.